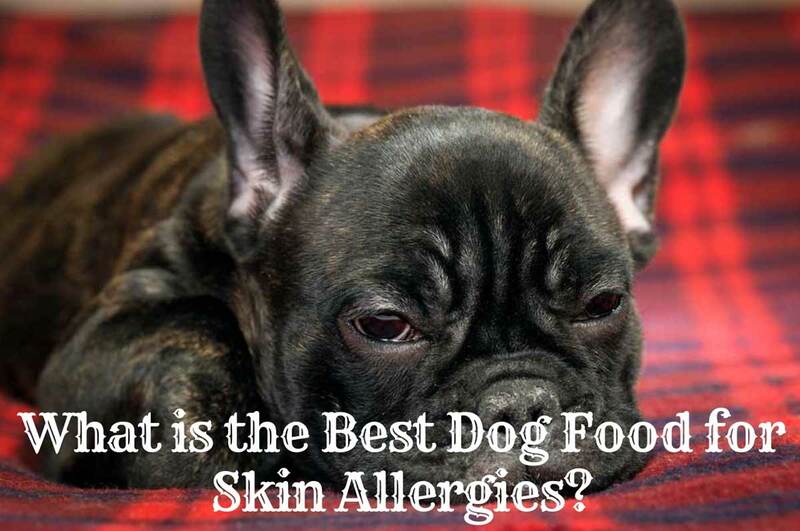 What is the Best Dog Food for Skin Allergies? ​The only reason why dog allergies are not as talked about as human allergies is that our little four-legged friends are unable to articulate their symptoms adequately. Both the symptoms and the causes for allergies in dogs are fairly similar to those in humans, with the slight difference that humans have a much better thermal regulatory system, as well as that most humans have less hair on their body than most dogs. Thankfully, dog allergies have entered the collective consciousness of the owners, and not most veterinarians will advise testing as to see if your dog has any allergies, and if yes, which ones. One of the most problematic allergies for dogs is food allergies, as they can create rashes and itchy skin, which can be quite troublesome for the furry creature. When such problems present themselves you will need to bring your pet to a trained veterinary professional, and will probably need to change the dog's diet, introducing either different food sources or hypo-allergic ingredients that will not trigger an immune response. What could be the Allergens for Dogs? As is the case with humans, allergies in dogs are an overwhelming reaction of the canine’s immune system to a certain compound or particle. This is especially the case when such allergen is fairly common such as dust or pollen, especially because for most other people and animals these sorts of particulates are innocuous and don't cause any problems. The reasons for forming an allergy are also similar to humans, as insufficient early age exposure may create a reaction later in life. When food allergies are developed inside the dog's immune system, there is usually another toxic compound in the mix with the immune system just flagging everything as dangerous, including the ingredients that are actually beneficial to the body, such as protein. Apart from the usual suspects in allergies such as pollen, dust, dander, plants, and insects, dogs can develop food allergies making them sensitive to common protein sources such as chicken, lamb, or veal. Protein allergies are very rare in humans, which is why we rarely focus on these problems in our pets. Finally, not all breeds of dogs are in the same risk group for allergies, as more traditional races have a much wider gene pool and are much more resilient, with small breeds and show dogs being more susceptible to allergies than other dogs. While you will reduce the change of your dog developing any allergies with good upbringing and nutrition, the baseline risk of allergy development is for the most parts genetic, and you shouldn't feel guilty for your dog developing them. As most homes are fairly free of dust, there is a large chance that a dog that lives inside the house dog will not be exposed to it as much as it would if it was an outside dog. What you should do is to bring your dog to a vet, and devise a plan to remove allergens from your dog's environment and especially from their diet. In this case, it is best to know what the specific allergy of your pet is and to work on that in particular, than to try troubleshooting the problem by removing all possible allergens one by one. The test can be conducted by a vet with a small blood draw, and quickly. Further, you should help your dog recover from the symptoms of the allergy as fast as possible by cleaning their fur, rubbing in some products, and cleaning their paws. Although there are high-quality products on the market, the impact a hypo-allergic food will have on your canine will heavily depend on the cause of the allergy. As most food allergies will have atopic dermatitis as the main symptom, you will not know the exact reason unless you perform the test. Once you know the specific cause of the ailment, you will be able to select a good product that will remove any allergens from the dog’s diet. This will usually leave you with several options that include both dry dog food and wet dog food from a can. If your dog has multiple severe allergies, you might find acceptable dog food slightly harder to find, but even then you will have at least a few options that will work for your dog before you need to start preparing food from scratch. 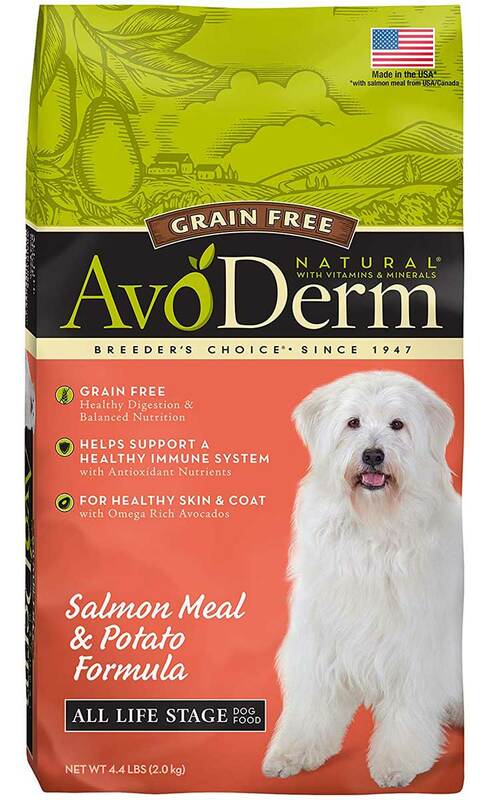 AvoDerm has definitely thought outside of the box and in addition to choosing a reasonably uncommon base protein for their formula, specifically salmon, they have also utilized an utterly unseen ingredient in their dry kibble, namely avocado. Avocado is not only fairly rich in protein for a vegetable (at 4%) and has beneficial fatty acids as the main component (at 23%) but is also rich in Vitamin C, Vitamin B-6, and with potassium, making it a perfect ingredient for skin care. Salmon as the animal protein source is also a good choice as it naturally contains Omega 3 fatty acids and is good for the immune system as well as fur and skin. As this is an abnormal protein for dry dog food, it is a good choice for dogs that are allergic to common protein sources, making it a good choice in dog food for skin allergies. Before the advent of hypo-allergenic dog food, the best option was to cook for your dog at home, the same food you would prepare for yourself. 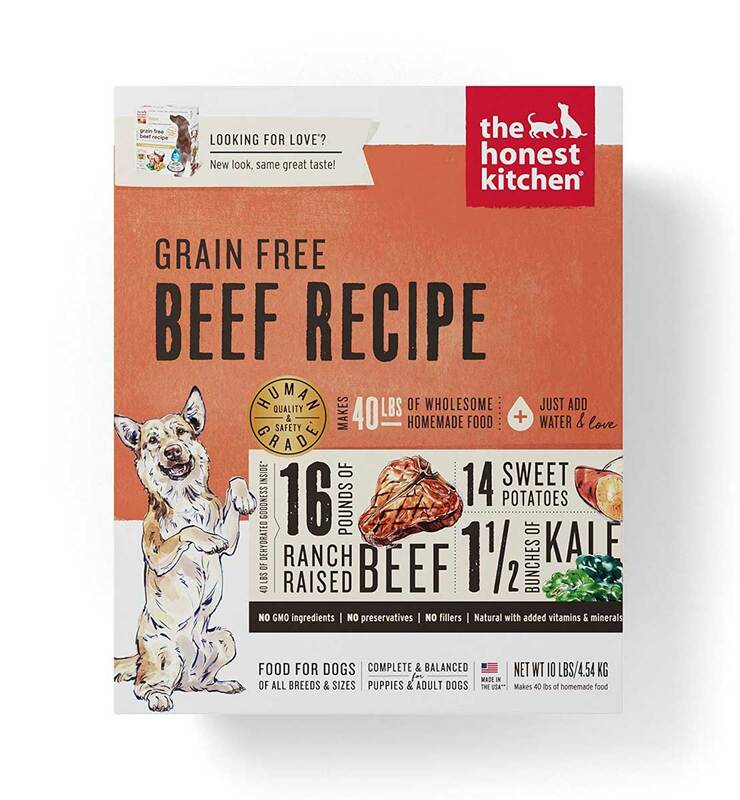 The Honest Kitchen has taken this to heart and created a dehydrated dog food variety that is made from human-grade ingredients, which is exceptionally rare even with premium dog food. Additionally, while beef is fairly common in human cuisine, that is not the case with dog food, meaning that this just might be a source of novel protein for your canine companion. Finally, it is important to know that this is not kibble, but dehydrated food. You should add water when preparing it to make wet food. Using the appropriate amounts (3 to 1 ratio), you will get about 40 lbs. of premium dog food from the 10 pounds bag. 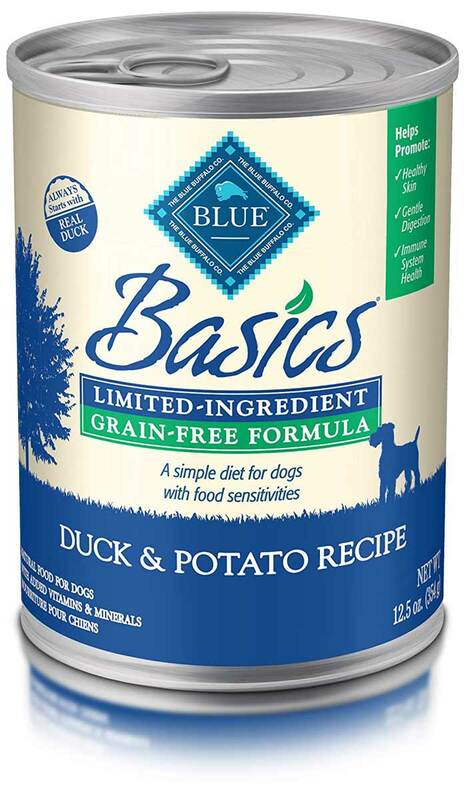 This duck-based wet food from Blue is made with allergies in mind, as there was significant care involved that there are no trace ingredients or fillers that may cause problems for your furry pet. The carbohydrate base for this food are potatoes, which are easily digestible by dogs and usually don't make any issues. Canned food is more expensive by weight compared to kibble, but provides an option of not having as many ingredients that would keep the food whole and preserved. This means that besides the two main elements, the only thing present is the vitamins and the minerals, as supplements placed to help your dog's health. The fact that this product contains fish oil can be either a great benefit or a problem, as it does have a lot of Omega 3 and Omega 6 fatty acids, but some dogs reject eating any food that smells like fish. While humans are unable to sense this smell, dogs can, and they will know if they don’t like it. 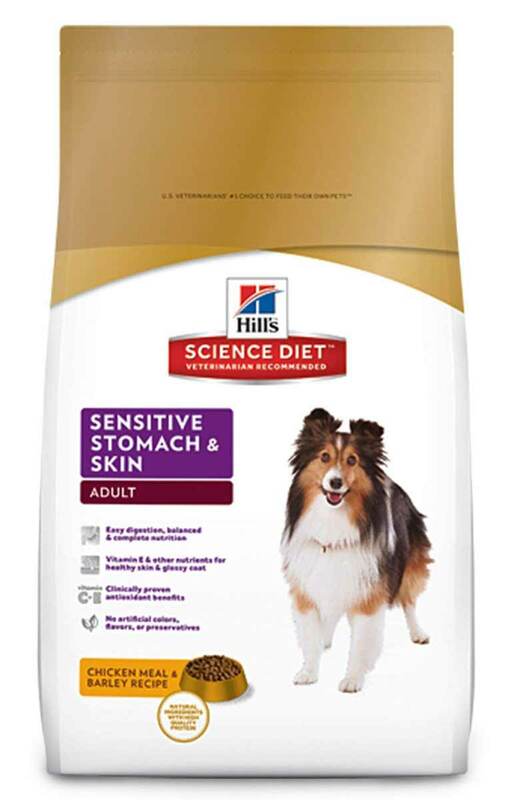 Hill's Science diet is the preferred choice for many when it comes to hypo-allergenic food that is based on common protein as it specially formulated for adult dogs that have food or skin sensitivities. Additionally, this dry dog food is clinically tested to improve the dog's immune system with antioxidants and vitamins B and E, which are both heavily included in the mixture. As it is presumed that this food will be used by a dog with allergies, there are clear instructions on the bag as for how you should substitute your current choice in canine diet. As not to induce more reactions from the immune system, you should replace the food reasonably slowly, giving the dog some time to adjust. The only downside to this product is that chicken is by no means a novel source of protein. If your dog is perfectly fine with eating this type of meat, then this is probably the best option in the market, but if your dog is allergic to the chicken, you will need to look elsewhere. If you are looking for a source of novel protein, you will never get more novel than feeding your cuddly little pup with some ‘gator meat. 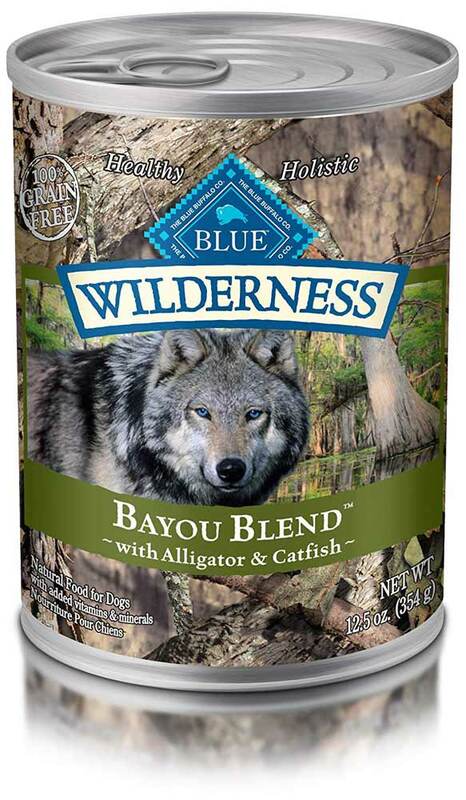 Unless you do live in the bayou and have gator for dinner every so often, this is not a meat source that is common for humans, let alone dogs. In addition of alligator meat, there is also catfish protein in the mix, which is different to other fish protein by the fact that it contains much more saturated fats and is more similar in that regard to land-bound animals than to its fish brethren. As this is wet canned food, it has only a few ingredients and no additional wheat, corn, soy, or any other grain, as well as no preservatives and artificial colors. Once you have determined the cause of your dog’s allergies, you should select a food source that doesn’t contain any ingredients for which your dog exhibits even slight allergic reactions. You should focus on simple mixtures that will give your pet all of the necessary dietary requirements for healthy growth and development, while not placing them in danger of a severe allergic reaction that can lead to rashes, fur-loss, digestive problems, and itching. If you are treating your dog from a to pic dermatitis, make sure to soothe your dog’s skin with an ointment or some other remedy depending on the canine’s skin type. This is preferable to washing the dog more than usual as water can dry the skin and fuzz the fur, making the problem worse. Aside from applying skincare, brush your dog regularly, which will not only assist in clearing any skin problems but will also calm the dog down and make it feel more at ease during this period. When the problem has cleared, remain feeding your pet dog food for skin allergies as you have only removed the symptoms, but not the underlying problem. As with humans, allergies never really go away, they can be avoided solely by having a good diet and a clean environment. 1 What could be the Allergens for Dogs?